What is so wonderful about making salads is the more you make them, the more you get comfortable with experimenting and discovering new favorite flavors, and the more confidence you’ll gain every day. Trust us, salads are addictive. Treat this recipe like a guideline; substitute whatever nuts, seeds or sprouts are your faves. leaves perfectly when you follow the steps. 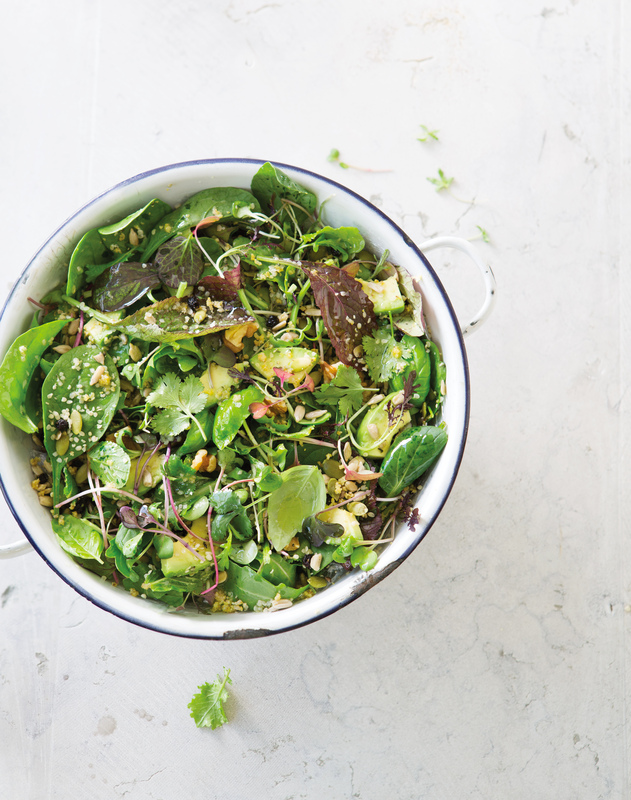 In a large bowl, mix the greens, herbs and sprouts and toss with lime or lemon juice. Add the avocado oil and coat the leaves thoroughly. Sprinkle with sea salt to taste. Toss until well combined. Add the walnuts, blueberries, hemp seeds, sunflower seeds, pumpkin seeds and toss well. Add the avocado chunks and toss gently to fully incorporate. Sprinkle with Brazil Nut Parmesan, if desired. Serve immediately. Two ways to slow down and maximize the moments that matter. Ooey, gooey and oh so sweet.